Located 22 km south of downtown Hyderabad, Hyderabad-Rajiv Gandhi International Airport is the sixth busiest airport in India. The airport is named after the former Prime Minister of India, Rajiv Gandhi. This airport is rated the Number 1 airport in the world (in the 5-15 million passenger category). Hyderabad, a potential transit hub of South Asia, is centrally located with well-connected national and international air carriers. One can reach Hyderabad conveniently from anywhere in the world . Delegates can expect a friendly welcome on their international flights with direct connections to Hyderabad. Hyderabad is also well connected to major metro cities throughout India by domestic airlines. Hyderabad has direct international connectivity to Europe (London), the Middle East and South-East Asia. 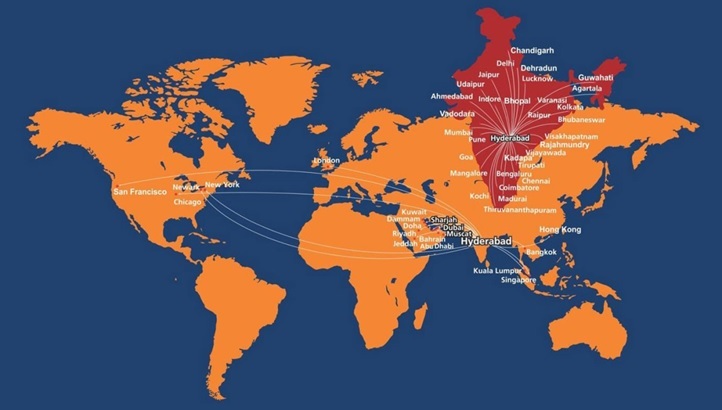 One can reach Hyderabad either with a direct connection from any number of major hubs or via New Delhi, Mumbai or Kolkata. Delegates can also take a connecting flight to Hyderabad via New Delhi and Mumbai, as both cities have direct connectivity to all major cities in the world and are within 2 hours flight time from Hyderabad. Fly with Qatar Airways to attend the 44th Annual Conference of ISPAD 2018 in Hyderabad, India and enjoy up to 30% discount. Please click here to benefit from the discounted fares. Kindly note that discount is applicable only for flights between October 1, 2018 and October 24, 2018. Frequency of trains from various cities – Secunderabad/Hyderabad is well connected by train network. Trains are available from Delhi (Telangana, Rajdhani), Mumbai (Hussain Sagar Exp. ), Howrah (East Coast Exp., Falaknuma Exp. ), Chennai (Chennai Express), Vishakapatnam (Godavari Exp., Falaknuma Exp. East Coast Exp. ), Bengaluru (Garib rath, Bengaluru Exp. ), Tirupati (Narayanadri, Venkatadri, Rayalaseema Exp. ), Trivandrum (Sabari Express), and Manmad (Ajanta Exp.). Most of these trains run daily. From any of these three railway stations, taxis/cabs can be hired to reach the congress center (from Secunderabad – INR 350, Nampally – INR 350. and Kacheguda – INR 400). The other option is to take the MMTS train to reach the Hi-Tech city station. An auto-rickshaw can be taken from there to reach the congress center and costs approximately INR 60. Delegates who arrive at any of these three stations in the twin cities can book a cab/taxi and reach their hotel. It costs INR 10-12 per km depending on the cab booked. Radio cabs (Meru and Sky Cabs) are available at the ground floor of the airport. These are licensed cabs approved by the airport and are air conditioned and metered. It costs around INR 900 – INR 1100 depending on the duration of travel. It takes approximately 30-40 minutes to reach the congress center by ORR (Outer Ring Road). These coaches operate between Airport – Shilparamam – Airport. It takes approximately 40 minutes one-way in peak hours and about 30 minutes in less traffic. These coaches run every hour from the airport throughout the day, and cost INR 212. The peak traffic hours are 9:00 – 11:00 and 18:00 – 21:00 in areas such as Punjagutta, Jubilee Hills, Banjara Hills, Madhapur, Ameerpet, Koti, Begumpet, and Kukatpally. Public transport comprises transport buses and metro railways to reach suburbs. Buses are well connected to all parts of the city. The metro trains also connect most parts of the city and are fast. When traveling with family, you can either hire an auto rickshaw (minimum fare is INR 14.00) or use a call taxi for longer distances (especially if traveling at odd times). Taxis/Cabs are available at any time and city buses are available from 5:00 to 23:00. INR 21 per km; minimum INR 40, which include the first 2 km travelled. Waiting charges @ INR 1 per minute during the dayand @ INR 1.5 per minute in the late hours. A 25% nightly surcharge is applicable between 23:00 and 05:00.